We recently discussed the new release of the top 200 dangerous areas for pedestrian and bicycling accidents in Massachusetts on our Boston Personal Injury Accident Lawyer Blog. Now we will be talking about the most dangerous intersections for car accidents. Many of these types of accidents are caused by driver inattention as these motorists fail to look for oncoming cars and pedestrians, as well as failing to acknowledge red lights. Our Boston car accident attorneys understand that intersection accidents are common in Massachusetts. Take the two recent intersection accidents that happened in West Roxbury at the intersection of VFW Parkway and West Roxbury Parkway. These accidents occurred just one minute apart from one another, according to the West Roxbury Patch. The first accident was a rollover accident and the second involved a two-car collision. 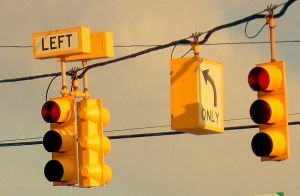 Red-light running is a serious problem at our Massachusetts intersections and elsewhere in the U.S. According to the Federal Highway Administration, there were nearly 2.5 million accidents at U.S. intersections in 2008. These accidents killed nearly 8,000 people and injured nearly 750,000 people. -Massachusetts Avenue and Prospect Street: 85 accidents. -Memorial Drive and River Street: 62 accidents. -Hollis Street and Waverly Street: 105 accidents. -Grand Army of the Republic Highway and Swansea Mall Drive: 110 accidents. -Market Street and Grand Army of the Republic Highway: 99 accidents. -Route 44 and Orchard Street: 91 accidents. -Broadway and Carver Street: 42 accidents. According to the National Highway Traffic Safety Administration, there were nearly 350 deaths resulting from traffic accidents in the state of Massachusetts in 2009. Nearly 100 off these fatalities resulted from car accidents that took place at an intersection. -Obey traffic lights at all times. These signals are used to safely control the flow of motor-vehicle and pedestrian traffic. -Never travel faster than the speed limit. These limits are in place to help reduce risks of a traffic accident. These limits have been researched and are used to help traffic to flow safely and efficiently. -Understand and abide by all traffic signs. -Red means stop or prohibition. -Green means go, or shows where you may go. -Yellow means you should slow down and serves as a general warning. -Black or white signifies a regulation. -Blue refers to a motorist service, such as hotels, food or gas stations. -Brown directs a motorist to a scenic, historic of recreational area. -Orange means there’s maintenance or construction nearby. -Fluorescent yellow or green signifies a bicycle, a pedestrian or a school zone. -Broken white lines separate lanes of traffic moving in the same direction. -Solid white lines can mark the edge of the pavement. -Solid white lines can also separate two lanes of traffic traveling in different directions. -Double solid white lines separate two lanes traveling in opposite directions. You’re urged to always follow all road signals, markings and signs to help prevent an accident. Make your driving predictable so that other motorists aren’t surprised by your maneuvers. If you or a loved one has experienced a car accident in the Boston area, contact Massachusetts Car Accident Attorney Jeffrey S. Glassman for a free and confidential appointment to discuss your rights. Call 1-877-617-5333.